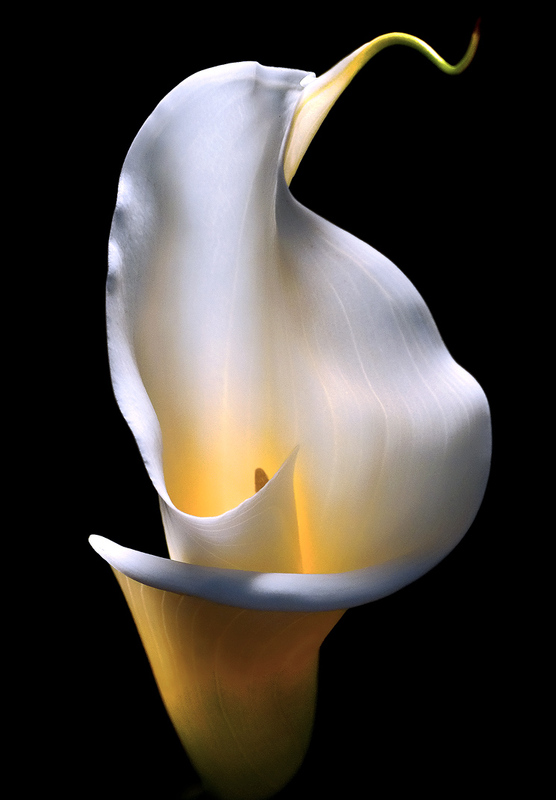 I thought I might take a break from posting my wildflower images and turn to an old favorite of mine and that is the Calla Lily, according to Wikipedia…..
Zantedeschia aethiopica (common names Lily of the Nile, Calla lily, Easter lily, Arum lily, Varkoor, an Afrikaans name meaning pig’s ear); syn. Calla aethiopica L., Richardia africana Kunth, Richardia aethiopica (L.) Spreng., Colocasia aethiopica (L.) Spreng. ex Link) is a species in the family Araceae, native to southern Africa in Lesotho, South Africa, and Swaziland. It is a rhizomatous herbaceous perennial plant, evergreen where rainfall and temperatures are adequate, deciduous where there is a dry season. Its preferred habitat is in streams and ponds or on the banks. It grows to 0.6–1 m (2–3 ft) tall, with large clumps of broad, arrow shaped dark green leaves up to 45 cm (18 in) long. The Inflorescences are large, produced in spring, summer and autumn, with a pure white spathe up to 25 cm (10 in) and a yellow spadix up to 90 mm (3½ in) long. 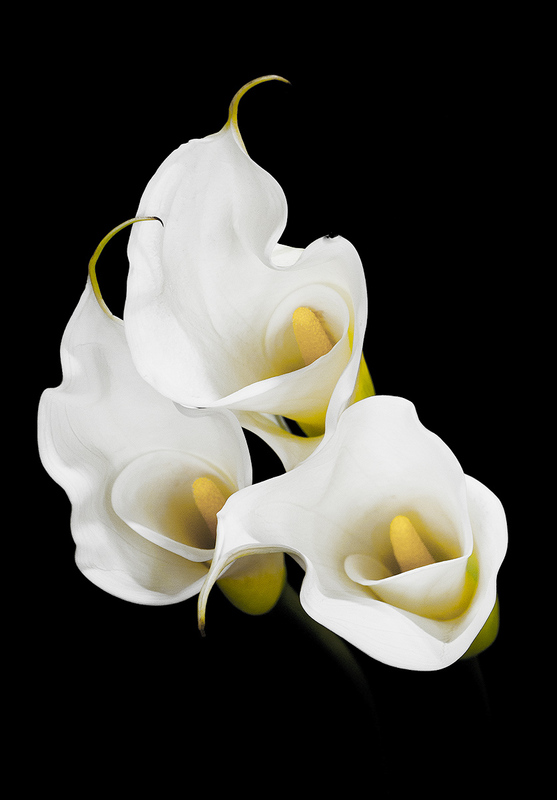 Zantedeschia contains calcium oxalate, and ingestion of the raw plant may cause a severe burning sensation and swelling of lips, tongue, and throat; stomach pain and diarrhea is possible. Zantedeschia aethiopica is native to southern Africa in Lesotho, South Africa, and Swaziland. It has become naturalised in Australia, particularly in Western Australia where it occurs in areas with high periodical water tables and sandy soils and has been classified as a toxic weed and pest. A number of cultivars have been selected for use as ornamental plants. ‘Crowborough’ is a more cold tolerant cultivar growing to 90 cm (36 in) tall, suited to cool climates such as the British Isles and north-western United States. ‘Green Goddess’ has green stripes on the spathes. ‘White Sail’, growing to 90 cm tall, has a very broad spathe. ‘Red Desire’ has a red instead of yellow spadix and appears to be rare. ‘Pink Mist’ has a pinkish base to the spathe. In order to introduce colours to the large white Calla Lilies just like the many colour varieties available with the dwarf summer Calla Lilies, attempts to hybridise Zantedeschia aeithiopica x Zantedeschia elliotiana have resulted in albino progenies, which are non-viable. It has been cultivated for the Easter floral trade since the early 20th century; hence the (ambiguous) name ‘Easter lily’, common in Britain and Ireland. It has become an important symbol of Irish Republicanism since the Easter uprising of 1916. It is the National Flower of St. Helena, where it grows widely. Sorry for the long description but I don’t have the patience to write that much !! But I do have the patience to photograph these beautiful flowers and I was especially happy with this specimen, I shot this in my portrait studio here in Madison Indiana, and used a light box and floor lamp to achieve this wonderful light. I think the warm yellow light that rose up thru the flower added a great touch to the image, I usually like all my Calla Lilies shot in B&W but this one had to be left in color because of that golden light. Hope you enjoyed the image as much as I did ans thanks for stopping by and taking a look, as always for best viewing click on the image !! As I sit here staring out the window onto a cold ,wet lifeless landscape my mind can’t help but to wander back to last spring when the woods and hills that surround my home here in Madison Indiana were ablaze with the vibrant colors of early spring !! The lush greens of the newly emergent foliage along with the beautiful colors of the blooms that adorn them always help to drive away the somber mood of late winter, especially after a long cold winter, bringing with it the anticipation of a warm and welcoming season I have longed far too long for. Nearly every color is represented by this natural wonder that bestows the valley I live in, from the early season whites of the Bloodroot to the late season red of the Wild Columbine, the color palette of this natural display never seems to disappoint even in bad weather conditions there is still plenty of beautiful color to be photographed !! If you are a macro photographer there is no better time of year to ply your craft, there is nothing more beautiful than a wildflower bloom freshly conceived from it’s bud and to be able to photograph it in it’s newly formed appearance is an amazing feet to be able to produce and witness. 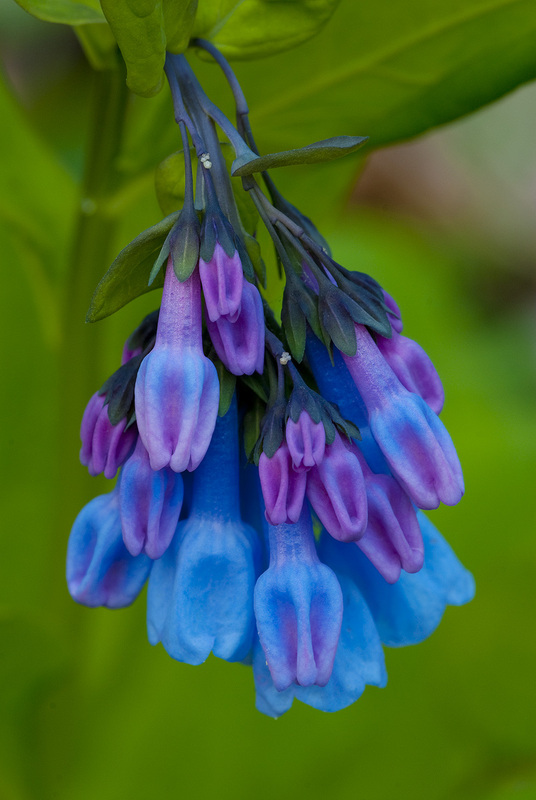 I photographed this lovely Virgina Bluebell just as it began it’s journey thru it’s life process, from it’s emergence from the soil till it’s ultimate decay and death, I am trully blessed to live in an are where I can witness and photograph such a wonderful process. it whether they want to or not. What a great day nothing to do but lay around for once, watch football and eat, don’t get many days like this. 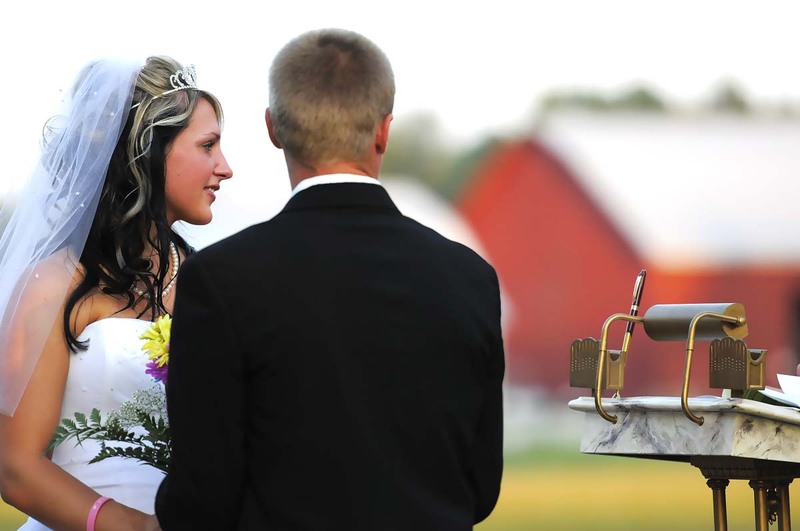 Just finished editing another wedding, ready to start another one and getting ready for the Madison Indiana Chautauqua next Saturday as well. But like a true photographer I thought now was as good as a time as any too post a image from a trip to the Great Smoky Mountain National Park from this past summer. 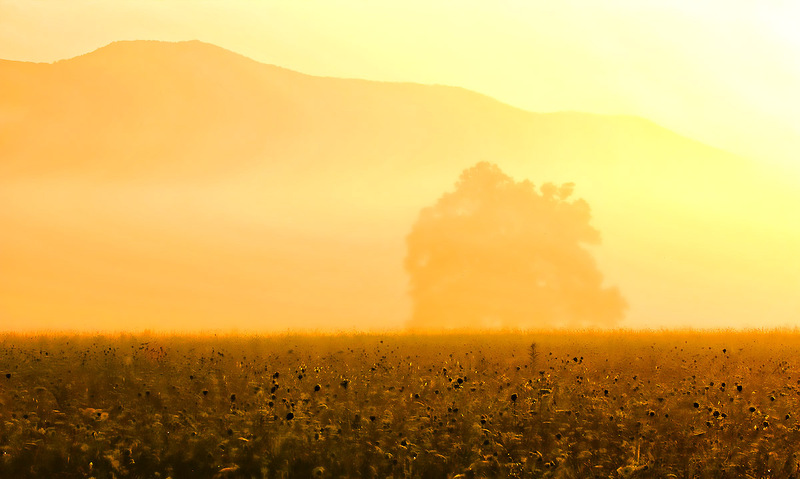 This was a shot from a beautiful summer sunrise from Cades Cove, the light was really sweet that morning and it was a wonderful day to be out early in the cove !! This isn’t the first time I have shot this tree but it was the first with the light playing out as it did, I kinda liked the surreal effect the light had on the tree and how it left such a golden hue across the landscape. There are not many places that I have visited that are as beautiful as Cades Cove especially in the morning, it is a definite must for any photographers out there looking for a wide array of photographic elements. From the bears and deer to the vivid fall colors and the wonderful spring wildflowers, throw in the fog and other climactic elements and you can see why it is such a amazing place to to set up a tripod and spend a day or two shooting !! So now it’s back to the Indianapolis Colts and they are still leading comfortably into the third quarter hope you have a great start to your week and as usual click on the image for best view !! Here is another shot from a wedding from a couple of weekends ago, this was a fun wedding to be involved with because of the laid back nature of the the couple and the attendees. The wedding was a blast as was the reception, they had a cowboy type theme and also the coolest prison wagon you ever saw !! I never thought I would have had such a good time shooting weddings but once again the art of photography has surprised me, there is a fast pace that you have to keep up with and being able to get the shots you are after is just as much as a rush as nailing that sunset or waterfall shot. So far the people have been great and treated us very professionally and with the utmost respect …haven’t met Bridezilla yet, I know I am still new at this but I learn with every wedding and I seem to take something away from each passing ceremony. Thanks for stopping by and taking a look and as always click on the image for best viewing !! Here is another wildflower image from earlier this spring, with no time to get outside and shoot nature images now I will have to rely on older shots that I haven’t had a chance to edit till now. 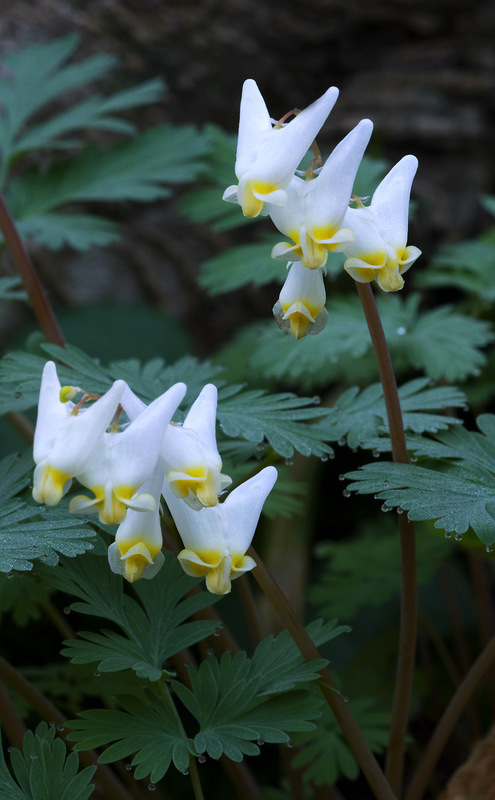 I shot these little wildflowers at Clifty Falls State Park near Madison Indiana earlier this spring, Dutchman’s Breeches are one of the coolest wildflowers in the woods, and one of my favorite to photograph. Thanks Alma for your wonderful and insightful writing hopefully that will keep me out of trouble !! So there you have it the lovely and unique Dutchman’s Breeches, hope you enjoy and once again click on the image for best viewing.